Electric vehicles could travel 1000km on a single charge, thanks to a new type of lithium-based battery, its developer claims. The device is the world’s first 1000Wh/kg rechargeable battery, according to its developer Innolith, based in Basel, Switzerland. The Innolith Energy Battery, which does not contain expensive exotic materials, is based on an inorganic electrolyte, according to the company’s chairman, Alan Greenshields. Unlike the organic electrolyte in conventional lithium-ion batteries used in electric vehicles, this inorganic electrolyte is non-flammable. In this way it could eliminate the main cause of battery fires that plague electric vehicle manufacturers, Greenshields said. “The core of what we’re doing is to [eliminate] the undesirable properties of lithium-ion batteries, in that they catch fire, or even explode, and don’t last very long,” he said. In traditional intercalation-based batteries, the lithium ions shuttle back and forwards between the two electrodes, but do not chemically react with the material, said Greenshields. Instead the lithium ions slide into gaps within the crystalline structure. “When you charge a lithium-ion battery, you force lithium ions out of the positive electrode, through the electrolyte and they intercalate into the negative electrode, and when you discharge it the reverse happens,” he said. In a conversion reaction system, in contrast, the lithium reacts with a material at the electrode to form a compound, storing energy in the process. When this compound dissolves into its constituent parts it releases energy again, said Greenshields. “As a result, at the electrode level, you have at least ten times higher [energy] storage per unit of mass, because you’re using an actual chemical reaction rather than the intercalation storage of lithium ions,” he said. 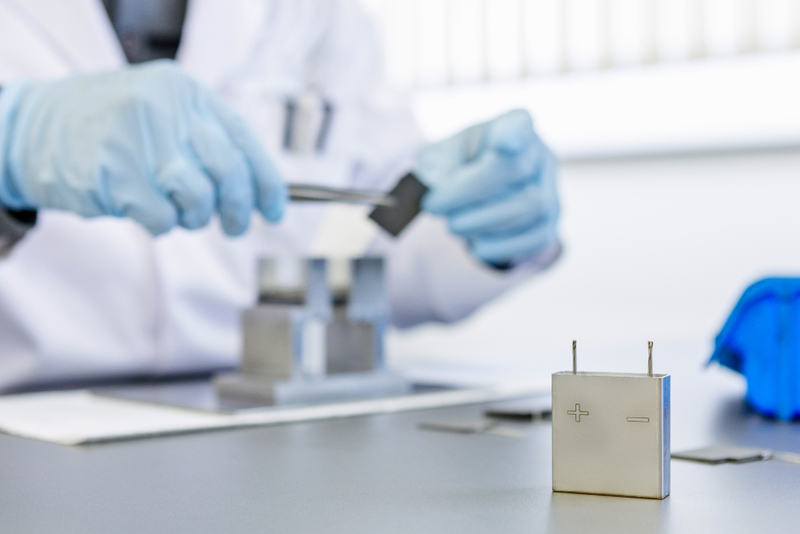 Innolith is planning to commercialise the high energy density battery through an initial pilot production in Germany, followed by licensing partnerships with battery and car companies, said Sergey Buchin, CEO of Innolith. The company anticipates development and commercialisation of the battery will take between three to five years. “We believe this battery will be suitable for all sorts of transport applications, including electric cars and buses, and with its high energy density we can also use it in drones and other aircraft,” said Buchin. The company has already developed a grid-scale non-flammable, inorganic rechargeable power battery, which is being used in the PJM grid in the US to provide fast frequency regulation services. Impressive, looks like a roughly 3-fold improvement on existing Lithium Nickel Cobalt Aluminium Oxide batteries. Still a very long way from the energy density of petrol but this battery technology would make electric cars a much more appealing proposition. indeed ! especially if coupled with more lightweight vehicles as potentially afforded by the ‘transparent aluminium’ article described elsewhere on the Engineer ! although I must confess ignorance of the conversion-reaction process as I do not understand the driving mechanism that allows the (normally highly reactive?) lithium to react at the unspecified electrode material ,then dissolve again to release the ion? Hope that we can get more info on this, it looks really original and different. The comments about conventional Li-ion batteries “Catching fire, exploding and not lasting long” does not augur well for the new fleets of battery based cars! Would be good to get responses from the car companies on this statement. Intercalation process is how Li+ cells operate now, but the problem really is two-fold: (1) low specific energy per Li+ ion transferred, as compared to deposition in a cathode (during recharge), and (2) fire hazard of organic electrolyte during over heat scenario. With an inorganic electrolyte (that allows Li+ ion to act as primary charge carrier), the fire hazard is eliminated, but also the possibility of intercalation of ions as the storage energy. By depositing the Lithium as metal in solution at a high specific surface area electrode, and by storing the resulting lithium ions from discharge reaction in the electrolyte, we are once again back to “normal” electrochemistry, but the ingenious part of this new cell is the inhibition of reaction of Lithium metal with any polar solvent such as water or alcohol. Thus, the cell exhibits a considerably (about 10 times) higher cell potential than for intercalation, and will allow about double or triple the level of energy storage density as kW-hr/kg. This is allow one changes the range from 250-300 miles to the much more suitable 620 miles. Once again, it is the PR and meaning(s) of words (often in the hands of scientific pygmies ) that is the stumbling block. How can we be spared the PR until there really is something truly innovative to talk about. I know, lets put them in charge of Brexit negotiations. That will keep ’em busy for years. Promising development. The keys to success will be replaceability and cost, and the number of charging cycles the technology can sustain. When the re-charging infrastructure is in place then EVs will take off! Once we get used to the constraints and society adapts to a different way of using personal transport we’ll have won! This sounds suspiciously like a re-launch of Alevo that went bankrupt in the USA 2 years ago. Its creditors failed to get sufficiently attractive offers for its much hyped IP, now presumably acquired by Innolith’s new investors. It is troubling that the back story to Innolith is not more transparent. Of course, as with Alevo, Innolith’s claims are extraordinary! Sounds impressive. All we need now is the electrical generation side of the equation to come up to scratch! !